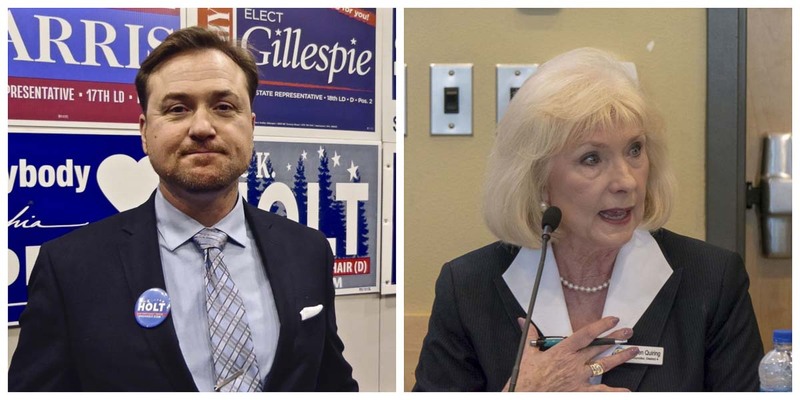 CLARK COUNTY — The race to become only the second Clark County chair will be a tight one. At the end of election night, just over 1,200 votes separated the two candidates, with Democrat Eric Holt holding the early lead. District 4 Councilor Eileen Quiring, who prefers the Republican Party, did not make herself available for interviews on Tuesday night, and has not released a statement as of this time. The Clark County Elections Department estimates some 45,000 votes are still to be counted, with new results due out Wednesday evening. Either way, Holt says he’s encouraged by the early results. If Holt does hold on to win, it will represent a dramatic power shift on the five-member council. Temple Lentz, a Democrat, defeated incumbent District 1 Councilor Jeanne Stewart. Lentz was leading by more than 21 percentage points in the early returns. Lentz and Holt both favor removing the moratorium on marijuana-related businesses in the unincorporated areas as one possible solution to the revenue issues facing the county. They may have enough votes to do it, if Holt can hold on to win. Quiring and Stewart have been two of the staunchest opponents on the council to ending the moratorium. ClarkCountyToday.com has reached out to Councilor Quiring and will update this story if we hear back from the candidate.